Why am I here? I ask that question in two senses. Why am I here on planet Earth? And, Why am I here blogging? I mean, that’s all this world needs is another blogger – Right? 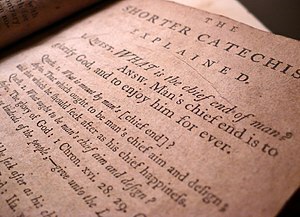 The Westminster Shorter Catechism asks the same question in a slightly different way. “What is the chief end of man?” The answer, “To glorify God, and to enjoy Him forever.” John Piper, in his book Desiring God, puts it a little differently, “To glorify God by enjoying Him.” I like that. I am here on planet Earth to glorify God by enjoying Him forever. Or, as the blog’s subtitle asserts, God loves us and wants us to be happy. As for creating another blog? Same reason. I enjoy writing, especially about God and His goodness, grace, mercy, love, kindness, power – you get the idea. It makes me happy. I hope to glorify God by my writing. I hope people reading this blog will come away from every post with a smile on their face, a deeper joy in their hearts; happier people. I enjoy God in a myriad of ways everyday – through His Word, His creation, His presence. Through my family by relation and my spiritual, community of faith, family. My desire, dream and hope is that because of this blog, as I share what I have learned so far in my faith journey with Jesus, up and down the path of life, that your journey will be a bit more enjoyable, joyous and happy. God is the King of the world, the Creator of the universe, and our Daddy. That incredible Being loves us and wants us to be happy! I am a Dad to four daughters. Two older daughters, Tifani and Brianna, who are in their twenties and are from my first marriage. My youngest daughters are a result of my present marriage; Sally and Kelly, ages 3 and 2. What an age difference! My two sets of daughters are somewhat of a microcosm of my experience with God and His love that I have encountered on my spiritual journey. I love all of them and want them to be happy. This wasn’t always the case. My first two daughters were born while I was in Bible college and “ministry”. I loved them, but being “happy” wasn’t a top priority. Being obedient, good little Christian girls was more important to me. I wasn’t such a happy guy either. I was a stern, hard-nosed father, generally no fun to be around. As they grew, they occasionally referred to me as “pharisee”, and I imagine the word “hypocrite” was sometimes muttered under their breath. In my mind and on my lips were verses from the Bible about God’s love, but they were not always on my hard heart. I didn’t think much about “enjoying God” or the idea that He wanted me to be happy. Thus a failed marriage and strained relationships with my daughters. Fortunately, God’s grace, mercy and stubborn love kept working on me. God was (and still is) the Hound of Heaven, who was constantly giving me good things I didn’t deserve, and constantly getting little messages into my head about how much He loved me and wanted me to be happy. One of my favorite verses in Psalms is from the 13th chapter, “I will sing unto the Lord, for He has dealt bountifully with me.” For a long time I was spiritually blind to God’s bounty in my life. All I saw was negatives, problems and selfish wants and “needs”. I didn’t always sing and give thanks for God’s goodness, because I didn’t always see it. I was blinded by spiritual pride and self-righteousness. Thank God, He never gives up on us, because He loves us and wants us to be happy and to enjoy Him. The Apostle Paul prays for the Ephesians, that the eyes of their hears may be opened, and that they will know the depth and riches of God’s love. Gradually the “eyes of my heart” were opened to the reality of God’s love, goodness and grace. As I grew in that love, goodness and grace, I wanted to share that with others, with “the least of these”, as Jesus puts it. I had wanted to be a missionary since I was a young teenager, mainly because it seemed adventurous. God wisely and mercifully put the brakes on that notion until I grew in the understanding and knowledge of His love, and could go to serve the “least of these” with the right motivation – Love. So here I am, in Oaxaca, Mexico, cooperating with God in helping needy children. I am part of a wonderful ministry called Foundation For His Ministry that helps the economically needy, physically needy, and most importantly of all, the spiritually needy, both children and adults, throughout Mexico. I have never been happier in my life. God has created us in such a way, that the more we share and reflect His love to a hurting world, the happier we will be. God has blessed me (made me happy) with Anita, my loving, vibrant, God-loving wife and two beautiful daughters. I regret the bad attitudes and wrong perspective that I had on life and about God in my earlier years, and the pain I caused other people. I thank God everyday for the mercy he continually pours out on me, and the fact that He can make all things beautiful in His time. I just turned 50 in December. Through the years, in spite of my thick skull, God has shown me and taught me about His love; His kind of happiness, and I have been truly enjoying Him like never before. With Sally and Kelly, I don’t care so much if they are perfect or obey all the time. I really care that they learn to love God, grow in His grace, are happy, and enjoy God. I pray that God helps me to be a Daddy that can be an example of that. I also pray that as people come ToEnjoyGod.com, that they will come to enjoy God in a deep, fresh way in every aspect of their lives. Next blog – If God loves us and wants us to be happy, WHY…? This was very good and very true. Keep up the good work! I am glad you liked it. May God bless you as you enjoy Him in 2013.